Cory and I are amateur astrophotographers, very proud of the works we produce. We put a lot of time, money and great effort into the photos we take. 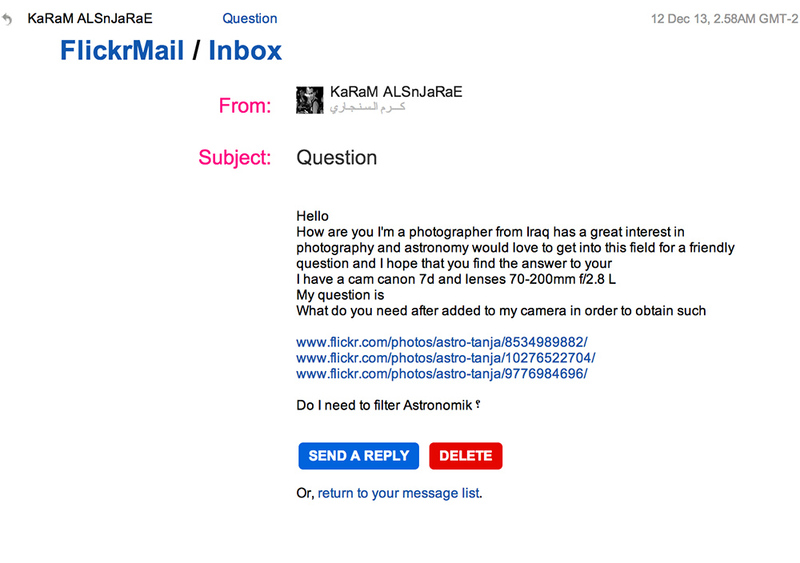 It was brought to our attention that a gentleman based in Iraq, Karam Al Snjarae, has been stealing our photos and posting them as his own. 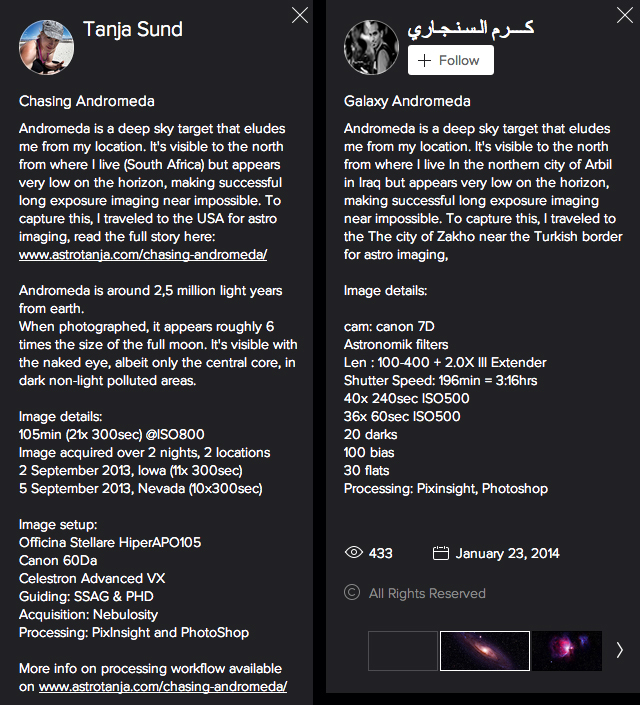 He posts these images on Flickr, 500PX and various other social media sites, and is now claiming that WE have stolen his images. Naturally we’re very upset. It’s one thing to repost with no credit – but to steal, alter by cutting off our signatures, repost with HIS signature on them and sell prints… That’s copyright infringement. Here follows simple examples of his poor attempt to fool the public. It saddens me that he takes advantage of users lack of knowledge on photographing and editing targets like these. To general photographers, he can find ways to justify these as his own works, but I’m hoping to serve internet justice by highlighting the “astronomical” mistakes he’s made. – He has none of the original photos in high resolution. WE HAVE. – He won’t have any RAW files containing the EXIF data. WE DO. 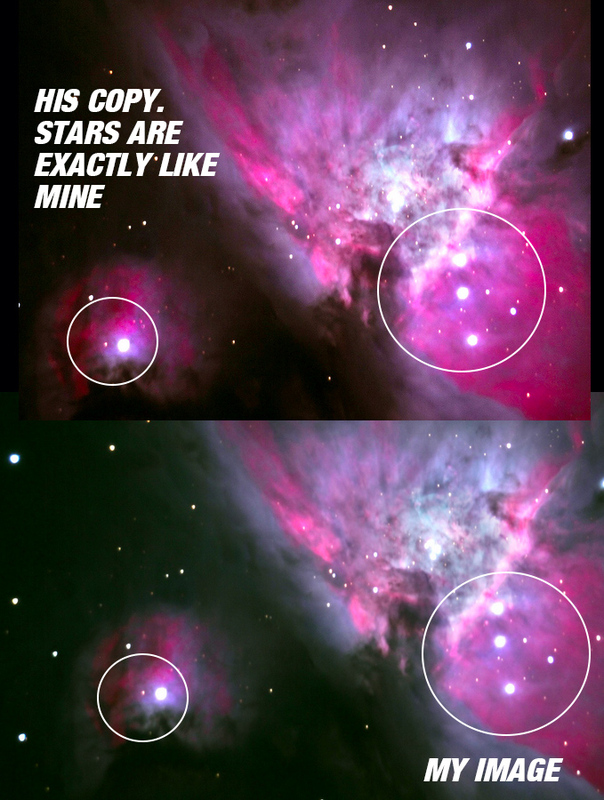 – Nobody is questioning him as general photographers don’t normally know astronomical objects. He’s made monumental errors, and posts wrong acquisition data with images. He’s removed stars & galaxies. – All his image post dates are AFTER ours have been posted. Here follows a few examples. There’s more, but this should suffice to expose him. This can be verified using Stellarium or any other sky charting software. – Zooming in – It shows poor cloning of the section where the original watermark has been removed. – The colour channels are incorrect, this was our image shot in Narrowband – not RGB. PITY…. it’s impossible to photograph this target from Iraq. This one hit hard…I traveled many miles and spent a lot of money to travel to the USA to photograph this target. He just stole it – even made minor changes in the description but it still reads as mine. 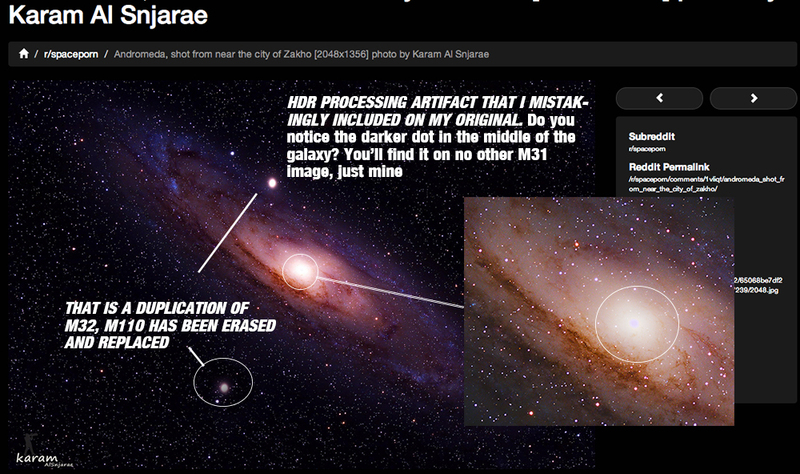 – My M31 contained an artifact caused by the HDR process I used. It’s a mistake on my part – it’s in no other image online but mine. His contains it too. Look at the center of the galaxy, there is a slightly darker spot. – He’s posted a more incorrect version. Highlighted below. – He even submitted this image to NatGeo. – He’s flipped and cropped my image, removed my watermark and placed his own. – Remarkable how much detail & quality he was able to get with a Canon 7D, don’t you think? 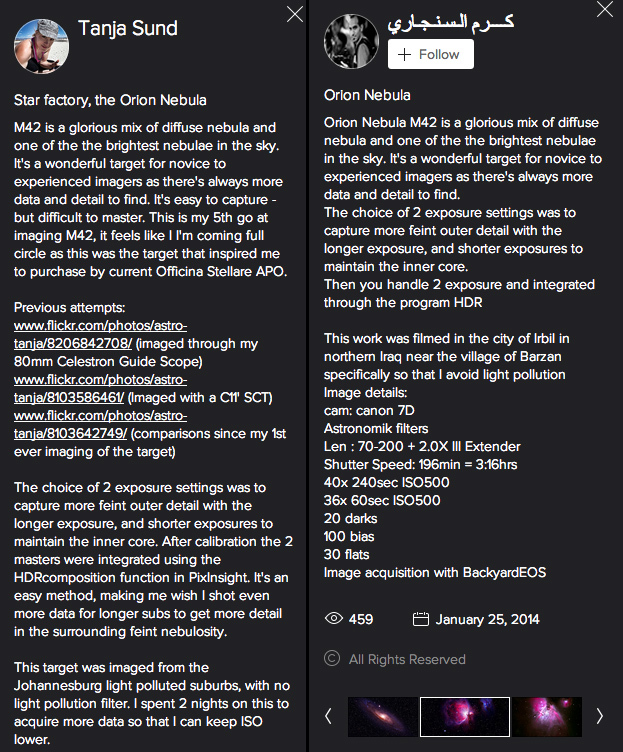 – He’s stolen my description – again… changed some acquisition data. He altered my original – although it’s clear to see the star trails that were evident photographing with my SCT C11 at 2800mm focal length. Images was altered and flipped. Where Cory’s signature has been removed, some stars are missing. He’s erasing existing stars! Here’s a screen capture where he’s trying to pass off our images as his. He’ll have no original RAWS for these, we do. We also have multiple supporting pictures that back up other angles of the same shoot. Do you want some original RAWs for these images…? We have them. 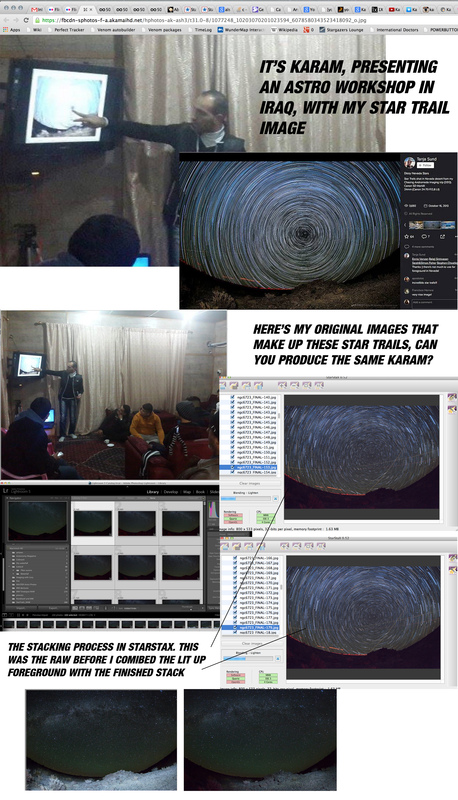 Here he is presenting a workshop with a stolen star trail image I took in the Nevada desert…. passing off the star trail image as his own. Please leave your comment or question. Feel free to contact me or Cory should you want further information. The thievery is despicable. There are more photos in his photo stream that were stolen from other imagers. Check it out, it might even be yours. And now the Internet battle continues. I have no doubt that he will fight back stating we stole them from him. The evidence is here, you decide. We can supply originals and higher resolution images of all our works, he can’t. We’d appreciate your help in exposing him! We’re no longer going to waste our time on the matter. Time is better spent doing the things we love and sharing our works freely with the world. He can backpedal and try, waste his time to try rescue his reputation that is now in question. And importantly – how do we go about protecting intellectual and creative property? That’s pretty sad. 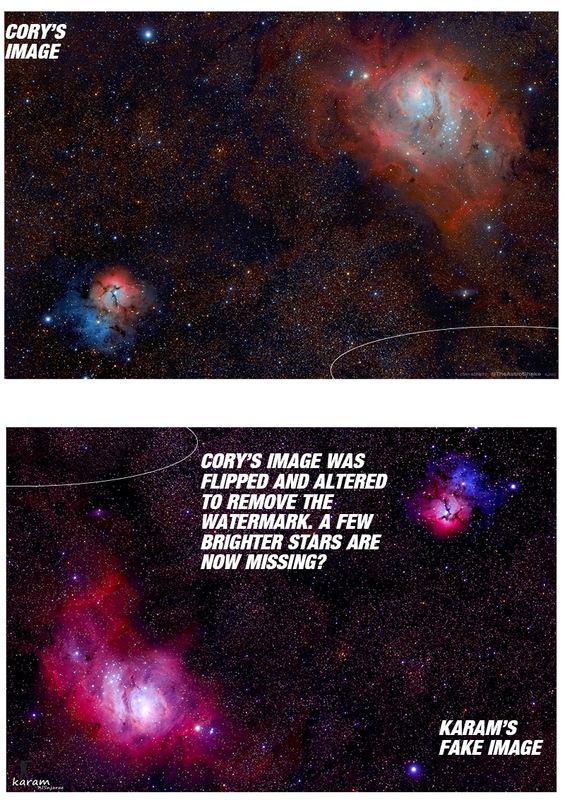 I know how hard the two of you work on these images and I know personally how much work goes into creating good astrophotographs, so to just blatantly steal it, remove watermarks and try and pass them off as his own is pathetic. On the bright side, I guess you could look at it as you have such great photos, they are worth stealing. =) I’l help spread the word about this guy for you. Cheers, Paul! Yes it’s sad. And thank you so much for your support! Oh dear! Well, you have all the provenance of subs, dates and alternate views. That must be some 70-200mm lens he has. That guy needs his legs Slapped Hard Now you two have Named and Shamed him on Twitter! How about just sharing them freely and not worrying about it? These sorts of silly arguments over natural wonders, free to all, are what keep people out of the hobby. That guy is certainly despicable but if people would take the profit out of this beautifu,l wondrous hobby and just share freely without caring who gets credit for what, there would be no reason to steal it and the hobby in general would be much more inviting to outsiders. I find the entire situation childish and absurd. These images are shared freely, on multiple platforms. I don’t mean to sound arrogant, but how is this keeping anyone out of the hobby? It’s not only an expensive hobby, but one that people take pride and enjoyment in sharing, and when someone takes credit for something that you have put your heart and soul (not to mention time and money into) the effects are felt. Your argument (if people take the profit out of it) makes no sense what so ever. How about film makes? Artists? Engineers? Anyone and everyone that creates something, not only do people make a living from these, but freely share the results weather they profit or not. Should others be allowed to not only share, but claim that they created this? I work in the feature film industry, and credits are something I, as do all of my colleagues, take a great deal of pride in. This is not a case of just posting other people pictures, which many original owners do shrug off, but going far beyond. Hi Stephen, let me clarify. Both Tanja and I have never charged any amount of money for online use of any of our images. We’ve thought about it, but in the end we just like to share them. In fact, I don’t believe we have ever said “no” to anyone who has asked to use our images for blog posts, news sites, TV, online video, and even workshops. We are all about freely sharing any of our images! Just ask, we’ll say yes. I did just today, again. And yesterday. And if I remember correctly, the day before. What you may not understand, and perhaps you didn’t read the post because it IS pretty long, was that this man took our images, and other’s, claimed they were HIS work, and modified them slightly to make it look like they were his. When confronted, he reported false details on how they were acquired “by him.” I’ve been made aware that this man was even selling our works, claiming to be a professional photographer to captured the images. 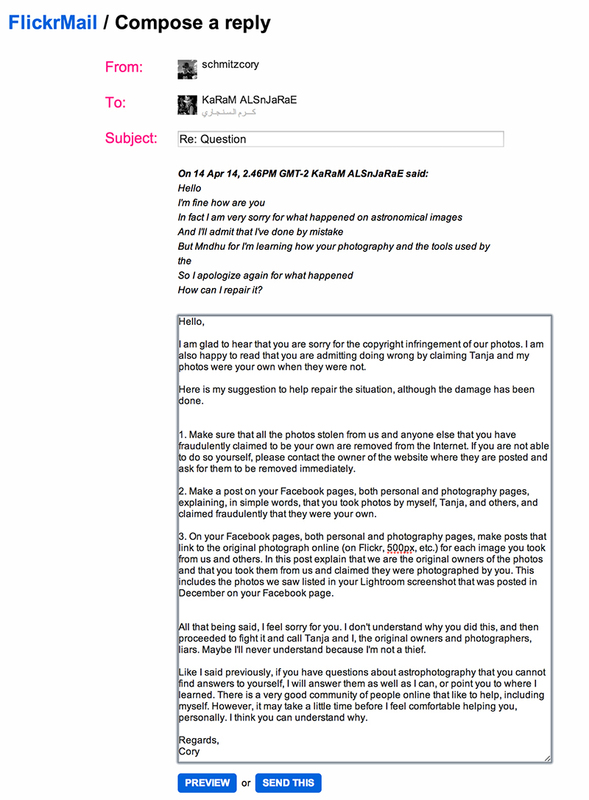 He then continued on to state that WE, the original owners and photographers, had stolen HIS images. Trying to prove and lie that he, in fact, captured images of objects that are geographically impossible to see from his location. 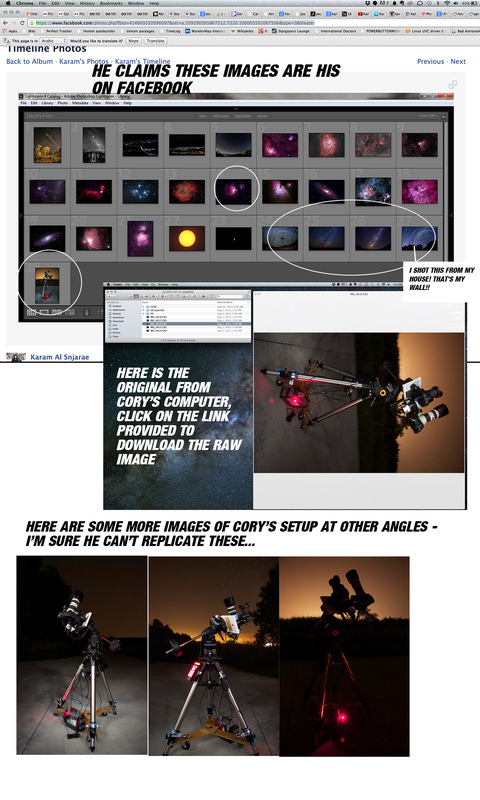 I see from your comment information that you link to solarastronomy.org, so I thought that maybe you had a clue as to how difficult and expensive it is to capture these images? We don’t sell our images right now, we may never do so. We share freely, we always have. Ask anyone in the community. Please do your homework before you accuse us of being greedy. 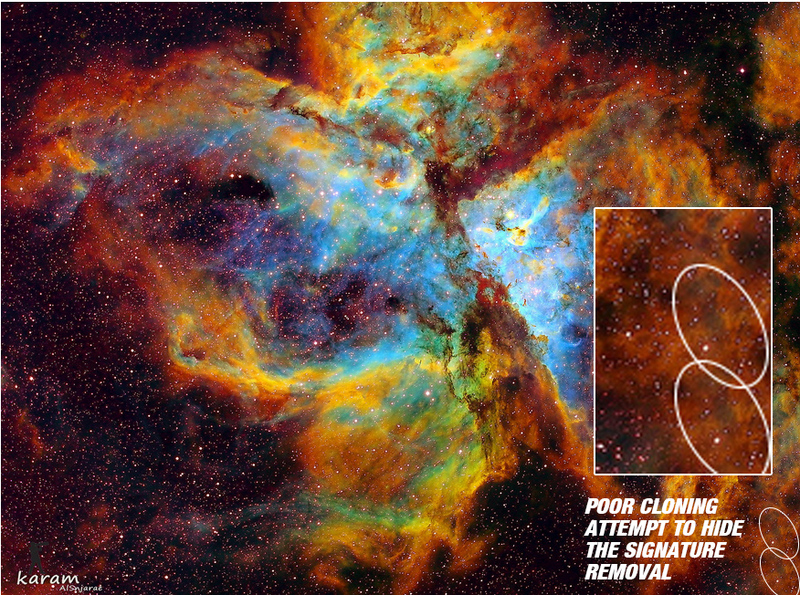 I equate this to a mild form of identity theft, and an atrocity in the name of the science involved and hard work that it takes to create these images. Not to mention spreading false scientific and personal information, misleading the public, lying and accusing, and theft. A back handed compliment, but… It really gets to me when this stuff happens, more so in this case to you, it takes not only shite loads of money, but countless hours and knowledge to capture what you capture, to have someone claim these is terrible. I think this is the most extreme case I’ve heard of (in terms of claiming other people work) The nerve he has to not only claim, but to present them, and “teach” based on these, I’m dumbfounded! Great blog post by you! I sent “his” 500px picture to a friend, who made it known to me that this image could not have been made the way he described to make it, hence the questions I asked him, asking to explain the process. I can tell you’ve taken this harshly, rightly so too! It’s good to see the support you’re getting from the wider community about this thievery. Well done to you and your fiance for the work and results you’ve achieved! 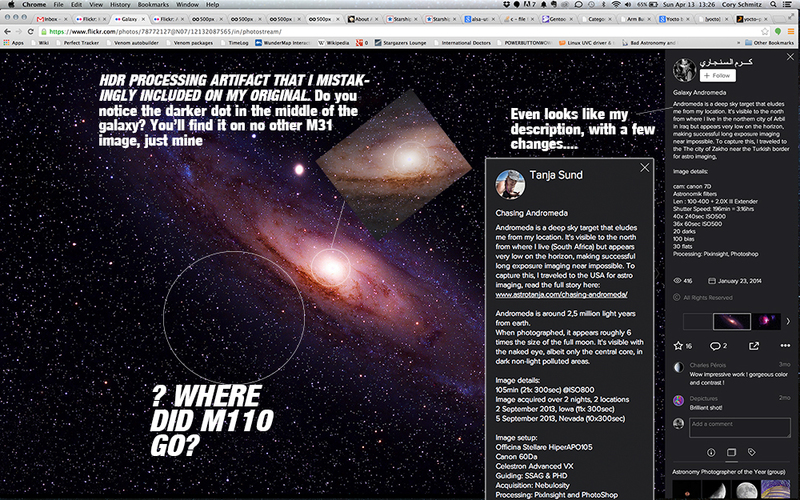 I went through his Facebook page, and he has an image of M81/M82 that there is no way he took with a 200mm lens. I’m in full support of the way you have dealt with this Cory in highlighting it across all the social networks, it’s great that he has admitted guilt now. I’ll never understand why people feel the need to take from others without credit, that which is not theirs. I fully appreciate all the work that goes into your images and Tanja’s especially as I just started with astrophotography last year and the equipment, time, energy and ability to grasp all the components to make a great picture are immeasurable. Never been one to sit on the fence, so when I had aurora borealis images used by 2 major UK newspapers without permission or credit (they actually cut off my copyright signature and upped the saturation – dreadful journalism) I confronted them straight away, however it took a number of solicitors letters to get them to actually admit the facts and settle, their excuse being they didn’t know how to contact me and expected me to be in touch with them! On that occasion I took it legal on principal as I’d already given local rags, a news channel and another London paper permission to publish freely, all of which had managed to contact me directly the same day, so why couldn’t the nationals? There is a real growing problem with IP theft on the internet which cannot seemingly be singularly addressed with one international law, although I’d like to see this happen particularly as it’s a world wide web matter. Spent a whole day researching IP copyright and recourse avenues after that episode. Like you and Tanja, I enjoy sharing these imaging moments with friends, followers and such, those that ‘understand’ have an unspoken agreement to play fair in this respect. I’ll be following this posting to see how you get on, I’m sure you are aware of the Flickr IP infringement form you can complete online too. Thanks for the support, Wendy! So far, it looks as if the Flickr photos are gone. So, hopefully that is the end of it. As for us, we’re moving on because we more data in the wings just waiting to share! Just seeing this now. It is just so outrageous! I am a US-based intellectual property lawyer (which includes copyright) and a huge admirer of the spectacular images produced by you and Tanja. If this ever happens again, feel free to reach out and I will be happy to assist you, no charge. We have laws in the US that make it reasonably straightforward for copyright owners to get infringing content pulled from social media sites such as 500px, Facebook, etc. Thank you, Wayne! This particular issue has been resolved, but we’ll keep you in mind in the future. You guy really showed him! I wish I could high five you both from across this monitor! Hahaha! I hope to their gets whats coming to him.